We have had several storms lately. When they cross over Lake Superior they lose a lot of their energy due to the lakes cool waters. One of the storms dissolved rapidly leaving a nice rainbow. 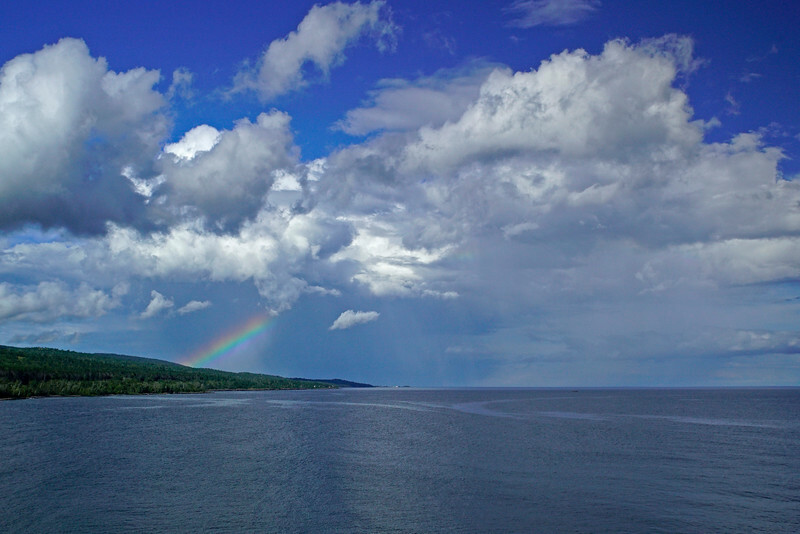 This photo was taken overlooking Grand Marais from the Cutface Wayside. 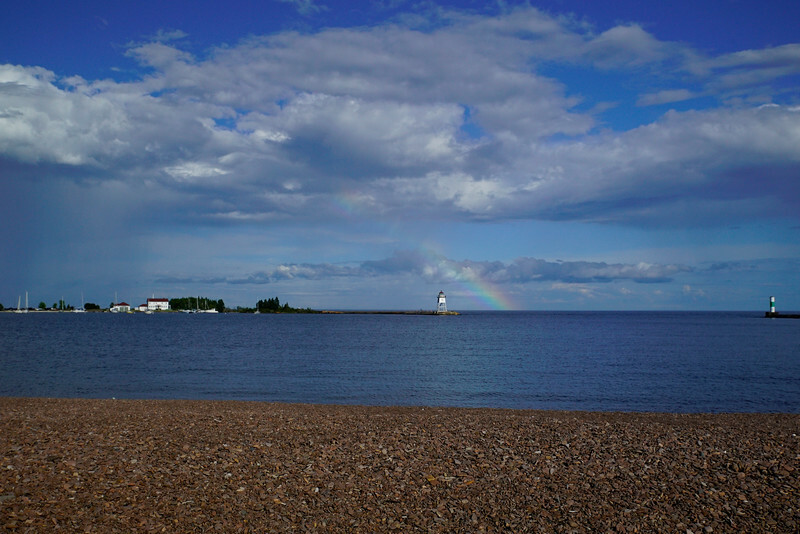 This was the other end of the rainbow after driving into Grand Marais. 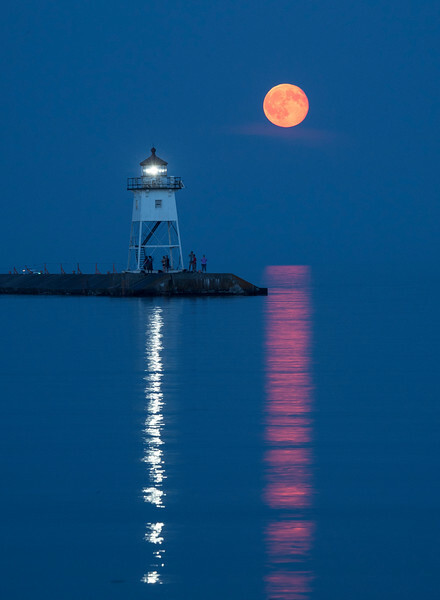 The July full moon is known as the Buck moon or Thunder moon, “Buck Moon” because bucks begin to grow new antlers in July and “Thunder Moon” because thunderstorms are more common this time of year. We have had our share of thunderstorms this July. 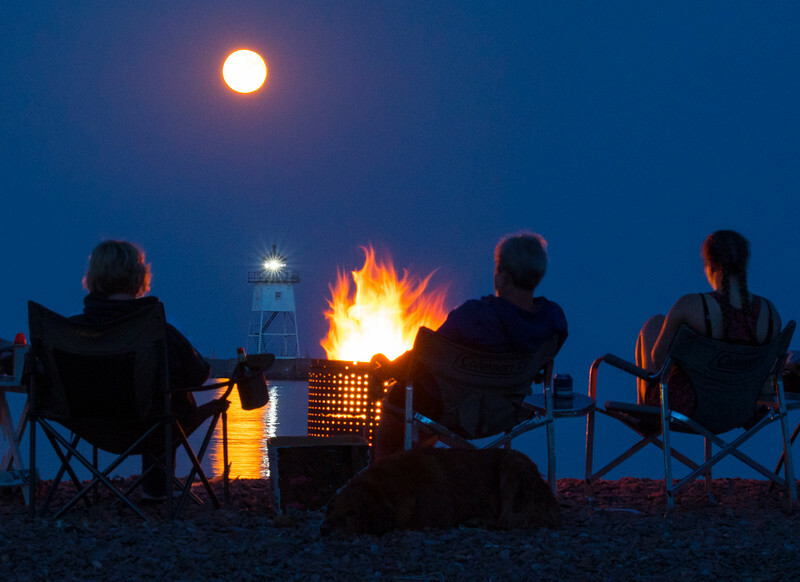 With the sweltering heat felt across most of the nation Lake Superior’s 48-degree waters has helped to air-condition the North Shore and literally kept Grand Marias as the “Coolest Small Town in America”. When photographing the full moon on Wednesday dozens of people were on the beach enjoying the cool evening temperatures. 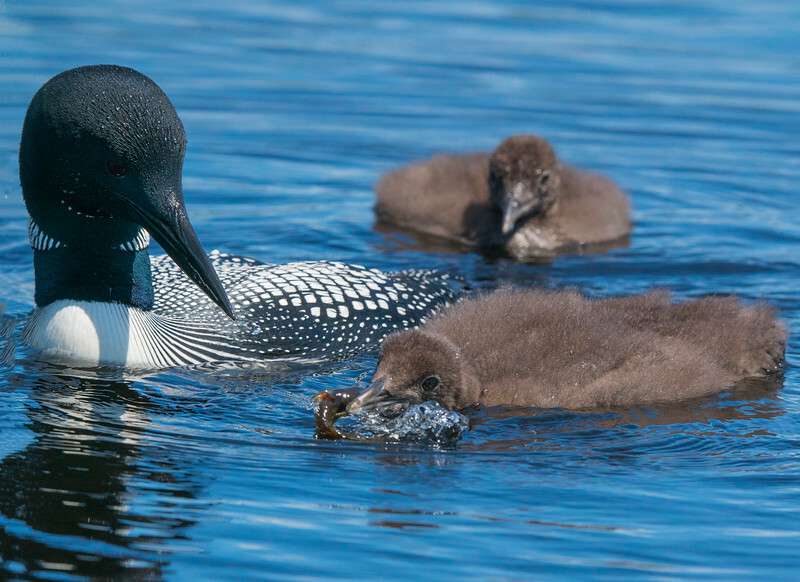 I went back to check on the loon family I have been photographing over the last few weeks. 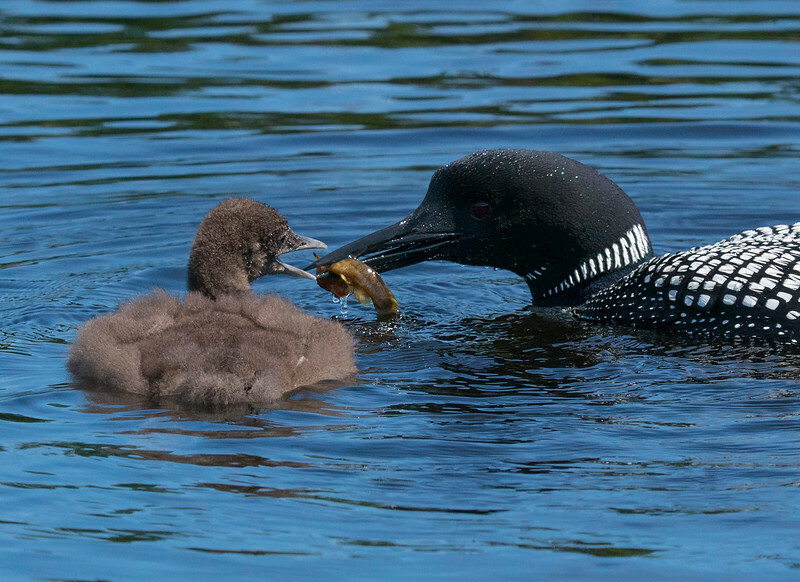 Mom and Dad are still busy feeding the little ones. Baby needs to try that out. 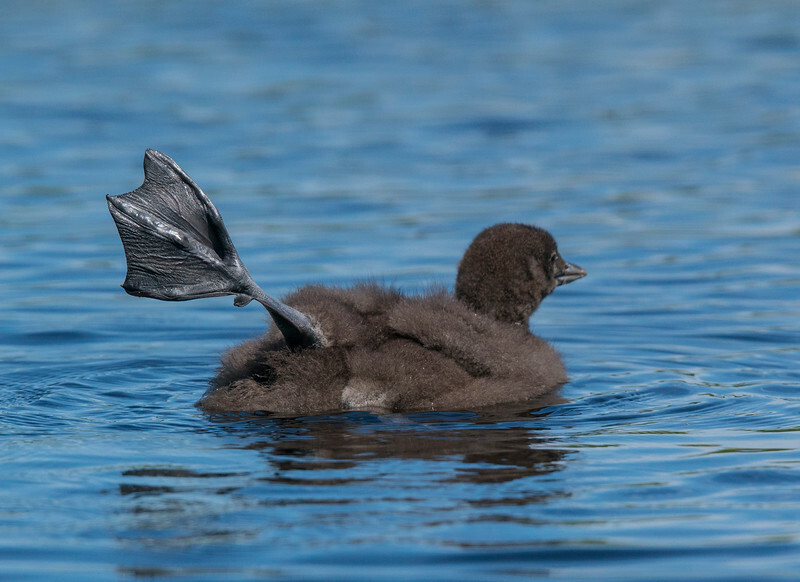 Both babies have survived numerous predators and still are doing well. 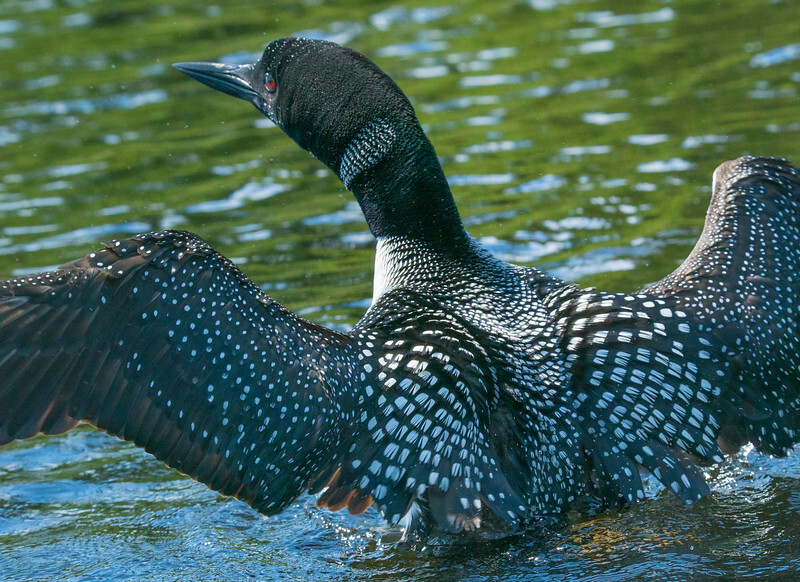 If you ever wonder why a loon can swim so fast just look close at the size of those webbed feet. Lunch is now delivered in larger portions. I think this is a bullhead that mom has caught. 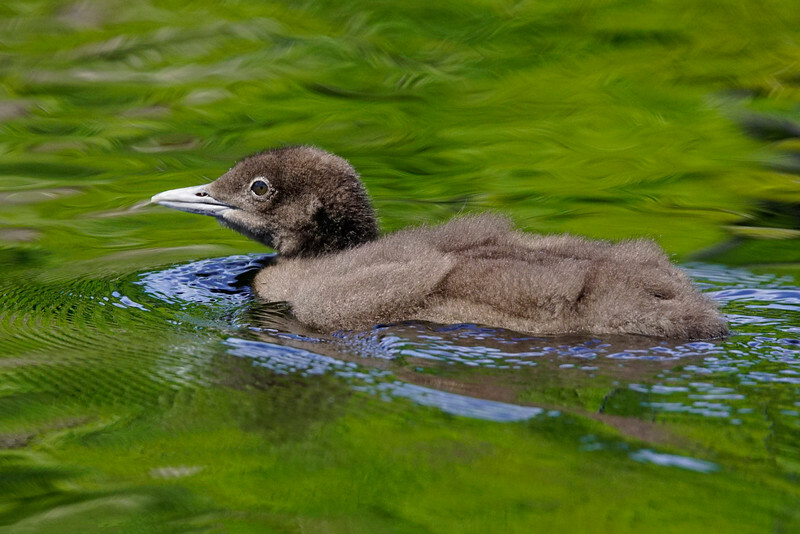 The parents are teaching the babies how to fish. They will bring in a wounded fish and let it go in front of the baby. The baby will then catch it on it’s own. Soon it is down the hatch. 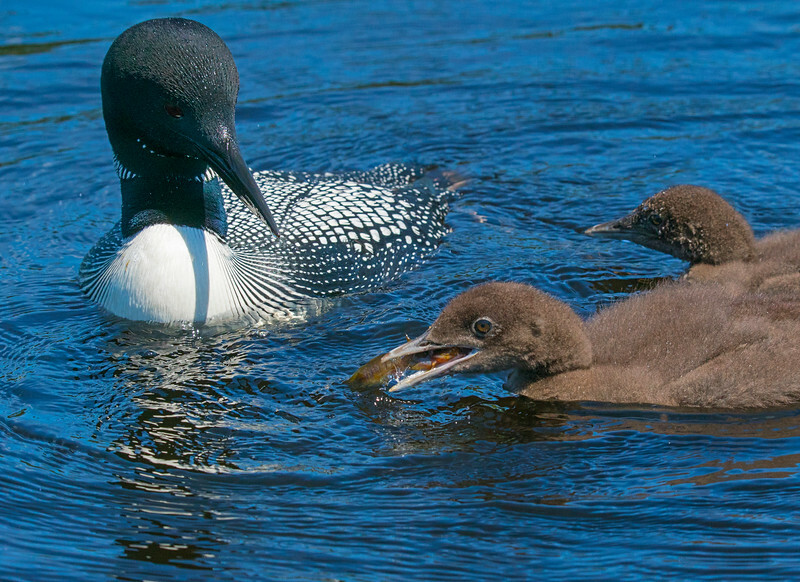 When photographing the loons they swam by a small cabin. 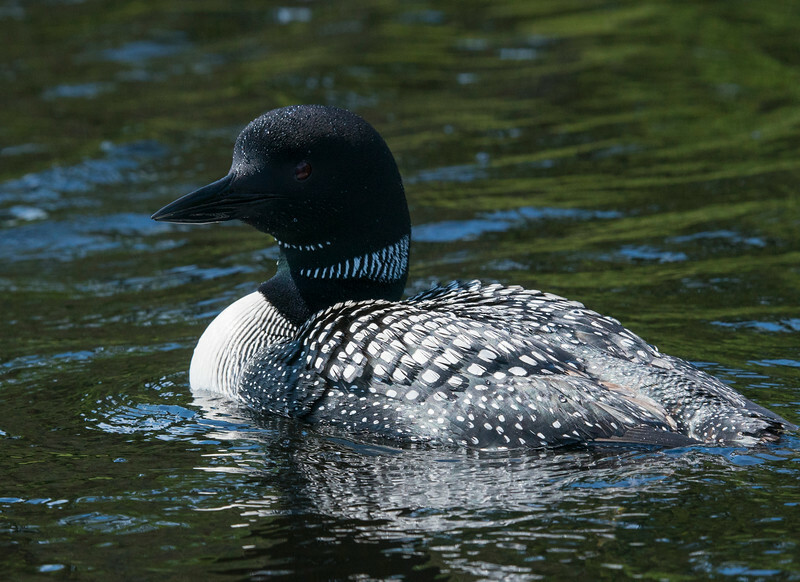 A young lady was on the dock and told us that she has been swimming with the loons in the mornings. 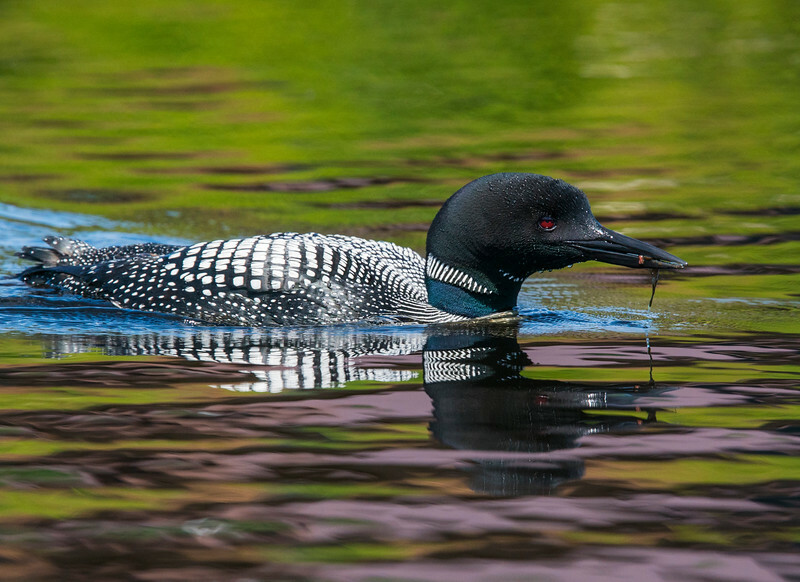 As the loons feed in front of her cabin she jumps in and the loons come to within five feet of her. 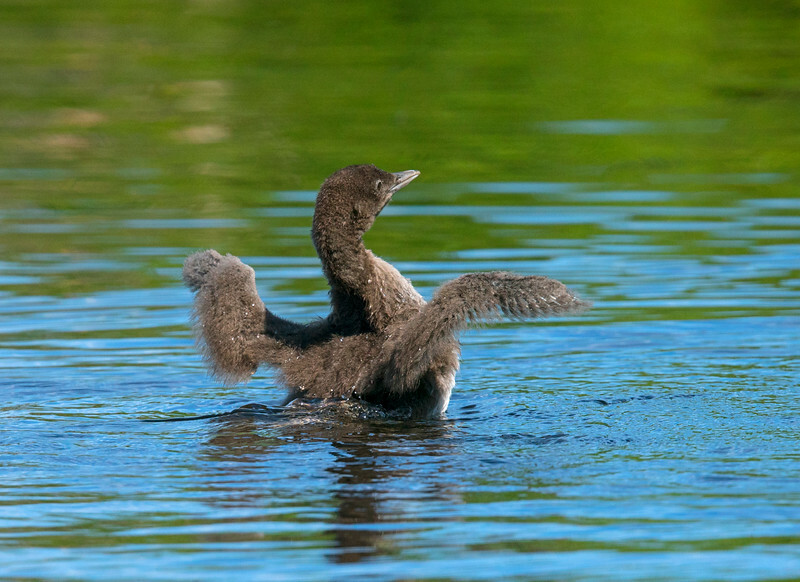 She was pretty excited to have a memorable opportunity of being able to “Swim with the Loons”.